This month is an awesome choice of Chocolate eclairs! 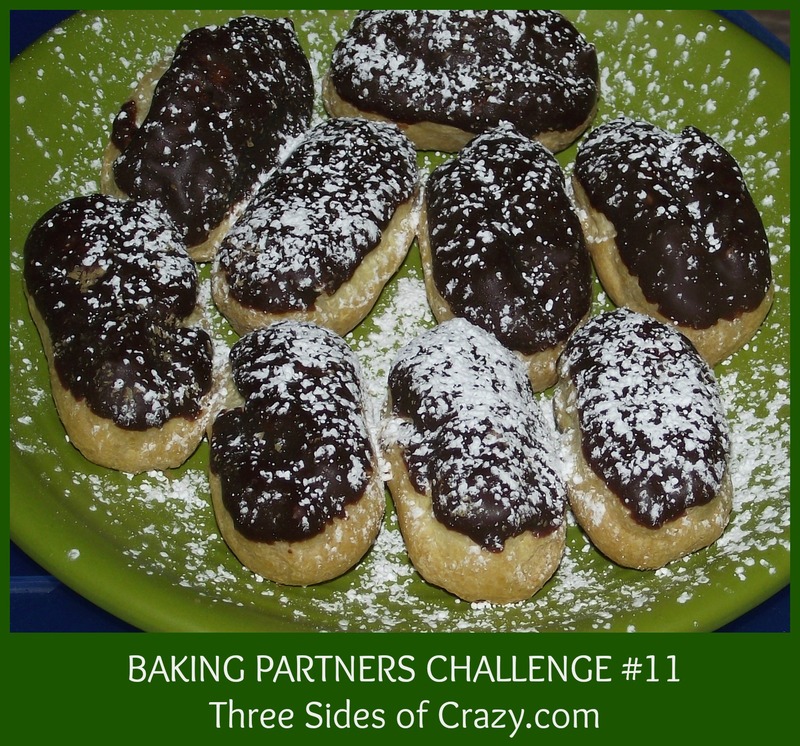 This month baking partner’s challenge we are going to learn, Pate a choux pastry, a French pastry, which is used in sweet and savory items. The recipe came from Thomas Keller’s Bouchon Bakery book. I have to admit my first batch turned out wrong, but it was all my fault working too fast. Batch #2 was delicious and perfect. There is also a recipe of chocolate éclairs recipe from Food network’s Alton brown. Please try to make both recipes if not at least one. If you don’t know what pate a choux is, here is the link you can read about it. We were asked to stick to the recipe as much as possible. You can see step to step tutorial of gougeres making from this link. Get your kitchen aid stand mixer ready with the paddle tool, if you don’t have kitchen aid use your hand mixer. Sift the flour and mix with the sugar, set aside. Combine water, butter and salt n a medium sauce pan. Place it over medium low heat and stir until butter is melted. When butter is melted turn the heat up and bring it to a simmer, then remove from heat. Add the flour/sugar mix and stir until well combined and the mixture has a paste like consistency. Then place over medium heat and stir rapidly until the dough pulls away from the sides and the bottom of the pan is clean. Immediately transfer the dough to the mixer bowl and mix on low for 1 min to release little of the steam and heat. After all the eggs are added, beat on medium for 2 min. When the paddle is lifted the dough should form a bird’s beak – It should hold its shape and turn down over itself. Transfer the dough to a pastry bag and chill until completely cold. Make a piping template by drawing six 15 cm/6 inch lines, 5 cm apart on parchment paper. Then place the template under the parchment paper you will pipe on. With a large star tip pipe the éclairs, following the lines on the template. When the pastry is reaching its 15 cm/6inch, begin to lessen the pressure, and then stop it as you bring the dough back over itself, leaving a little curl at the end. Wet your finger and gently press down the tip of the curls. Spray the éclairs lightly with water. Place in the hot oven and immediately turn the heat down to350°. Bake for 40 min, rotating the pan half way through. Lower the temp to 325° and bake for additional 20 min. Lower the temperature to 300° and bake for 10 more minutes. Your puffs should now be light brown, light and hollow. Combine the custard powder or all purpose flour and cocoa powder in a small bowl. In a bowl add some ice and water and set aside. This is our ice bath. Whisk in egg yolks and sugar by gradually adding sugar and to this add custard powder or flour mixtures then add milk and combined very well. Heat the above egg-sugar-flours-milk mixture over medium heat until it begins to thicken with constant string. Pour the pastry cream over the strainer and pressing gently to push the thickened cream through. Whisk for about 1 minute to cool. Then add butter in 2 additions and mix in well. Then add melted chocolate and mix in very well until everything is combined well. Transfer to air tight container and line with plastic wrap on the top to prevent the film from forming, refrigerate for at least 1 hour and you can keep this chocolate cream for about 4 days. When you are ready to use the cream transfer to bowl and stir gently until it has creamy consistency. Instead of chocolate pastry cream you can also use orange custard. I chose the orange to help make the flavor more delicate and then topped them with a chocolate glaze. In a small saucepan, warm the milk and orange zest over low heat until it is just hot enough to steam. While the milk is warming, whisk together the egg yolks, sugar, flour, and cornstarch until the mixture is completely smooth. Temper the eggs by adding a little bit of the warm milk and whisk constantly. Add little at a time until you have added half of the milk. Then pour the eggs/milk mix into the pan with the remaining hot milk. Heat it over medium heat and stir constantly until the mixture reaches 170° and is very thick. Remove from heat and stir in Grand Mariner. Chill before piping into the Éclairs. Use a 0.4-0.6 cm plane tip. Fill a pastry bag with custard of your choice. Place the tip of the pastry bag into one of the holes and begin filling the éclair. Pipe cream as needed into the second hole or until the éclair feels heavy. You should use 1/4 cup of cream.